Presented By: Urban Ranger Mobile Cinema (a not for profit entity). URMC showcases only international, non U.S. production, foreign language films once each month. Selected films are often from, but not limited to, Korea, Japan, China, Malaysia, India and Russia. Info: ReconAlphaOne@Gmail.com for questions, upcoming movies, showtime and email or SMS notification requests. Venue: Renton Public KCLS Main library in the King Parker meeting room. Technical Specs: Epson PowerLite Pro projector on a large huge screen in FHD 1080p. Date: Saturday, November 24th. Seating: 1:00-2:00pm. Showtime: 2:00pm-4:05pm. Admission: Free to public at large; first come first served. Seats: 44 max. Language: Spanish. Subtitle: English (custom fonts, typographically formatted, precision syncing, color coded; ReconAlphaOne). MPAA Rating: None. Strong language. Parental guidance is advised. Running Time: 124 minutes (2 hours 4 minutes). 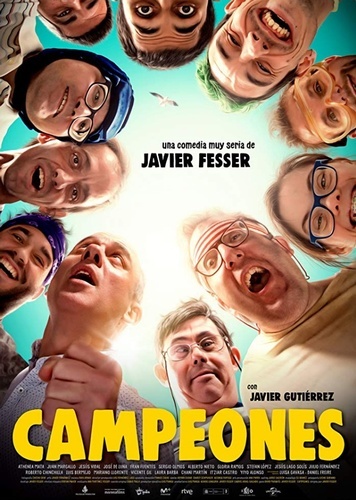 Wiki: https://en.m.wikipedia.org/wiki/Champions_(2018_film). Rotten Tomatoes: https://www.rottentomatoes.com/m/champions_2018/. IMDB: https://m.imdb.com/title/tt6793580/. SIFF Trailer: https://m.youtube.com/watch?v=3qgci10WwmE. Event Poster: http:///tinypic.com/r/e0odnb/9. BYOS: Bring your own snacks and or drinks as per KCLS guidelines.